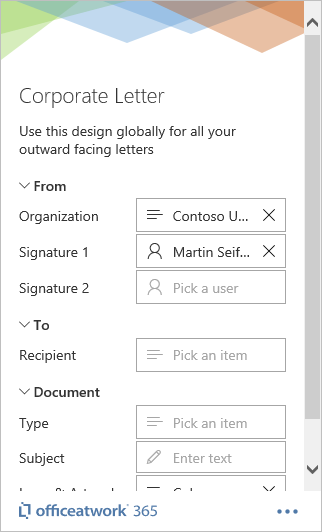 Use «Personalize» to make your personal selection and input for your document so it is purpose fit for the specific intent of your individual documents. A thoughtful designed document will display its fields grouped by contexts like From, To etc. A «Text» field allows you to enter any text into the field. Just click into the field and enter your text. You can also use copy and paste within the field. An «Item» field will allow you to select from a list of items. To select an item just click into the field. A flyout will appear allowing you to pick and search your items. The search option will not always be available, depending on the data connected to the «Item» field. After selecting an item the flyout will automatically close. To clear the selected item just click the «Delete» icon at the end of the field. To change an existing item just click on it to bring back the fly out. A «User» field will allow you to select from a list of users. To select a user just click into the field. A flyout will appear allowing you to pick and search for a specific user. After selecting a user the flyout will automatically close. To clear the selected user just click the «Delete» icon at the end of the field. To change an existing user just click on the user to bring back the fly out. Some fields like the «Item» or «User» field are connected to an external data source. 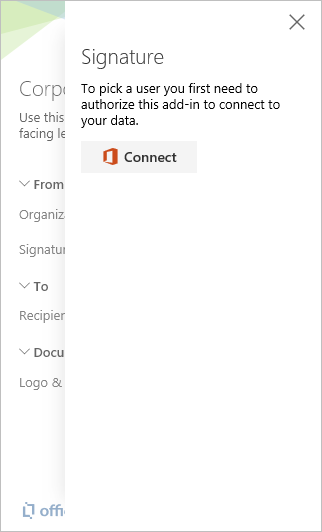 Sources you have not recently used will present a «Connect» button enabling you to allow the «Wizard» Add-In to connect to the data source sourcing that specific field. In this case you first need to click the «Connect» button and go through an authentication flow to be able to see the items for that field. Tip: When copying and pasting content into your document you might also include some placeholders that are customized to work with the «Wizard». To make those placeholders visible to you in the «Wizard» you just need to reload the pane by clicking the «Personalize» button in the Word ribbon.